Shane is a villager in Pelican Town who is often rude and unhappy, and suffers from depression and alcohol dependence. However, his attitude starts to change towards any player who chooses to befriend him. He works at JojaMart most days between 9am and 5pm, and after work he frequently spends his evenings in The Stardrop Saloon. He doesn't work on the weekend except on rainy days, and is frequently around the ranch. You can give Shane up to two gifts per week (plus one on his birthday), which will raise or lower his friendship with you. Gifts on his birthday (Spring 20) will have 8× effect and show a unique dialogue. "Because there's so much to live for!" (No effect on friendship.) "Maybe for you, but not for me! You're not going to understand... Just... go away. ...Ugh..."
"Jas needs you. You're like a father to her." (No effect on friendship.) "...You're right. Jas... Ugh, God... I'm a horrible, *hic*... selfish person. Now I feel even worse..."
"It would be a sin." (No effect on friendship.) "Yoba...? (Player), don't you know I'm an athiest? Ugh..."
"The decision is your own. Just know that I'm here for you." (No effect on friendship.) "Thanks... I appreciate that... I really do." 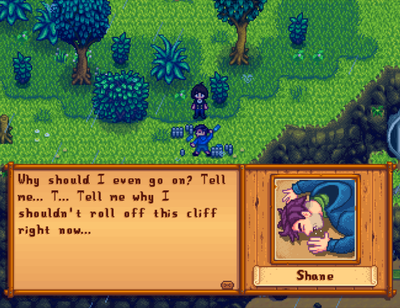 After that Shane suggests that you should take him to the hospital, in the next cutscene Harvey treats his physical ailments but is more concerned about Shane's mental health. He tells you that he's going to recommend Shane to a counselor in Zuzu City once he wakes up. "I'm glad I was there to help." (+10 friendship.) "...Yeah, me too." "You needed a serious wake-up call." (-10 friendship.) "I know... That's why I stopped by, to tell you about it." "I'm just happy you're still here." (+10 friendship.) "Wow, it was that serious, huh? I can hardly remember..."
You will find Shane filming a scene starring Emily and Clint. Shane will explain to you that Joja is holding a contest to create an advertisement for the newest Joja Cola, and the winner gets 10,000g. He will ask you to walk behind Clint and Emily as they act so the scene feels more natural. When it's over, he will thank you for helping him. "Noisy... It makes me appreciate how peaceful it is back home." (No effect on friendship.) "Oh yeah? I guess that makes sense. Me? I get bored with Pelican Town sometimes. But... I like that you're different. We balance each other out." "Fun... Pelican Town seems really boring in comparison." (No effect on friendship.) "Oh really? I'm surprised... 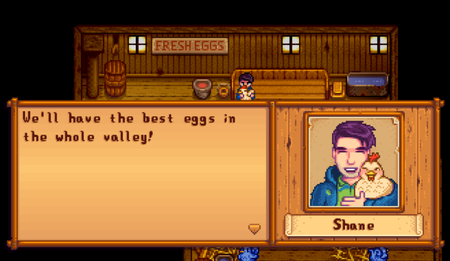 Didn't you move to Stardew Valley to escape the noise of the city? I mean... Don't get me wrong, I totally understand. My life in Pelican Town is pretty bland, you know." If the player is unmarried and has given a bouquet to all available bachelors, raised friendship with each bachelor to 10 hearts, and seen each bachelor's 10-heart event, then entering The Stardrop Saloon will trigger a cutscene. If the player has a Rabbit's Foot in inventory, the cutscene will consist of a friendly game of pool. If the player does not have a Rabbit's Foot in inventory, all bachelors will express anger about the player dating them all at one time. Regardless of the player's dialogue choice(s), all bachelors will decide to give the player the "cold shoulder" for about a week after the event. They will give angry dialogue when interacted with, and refuse gifts. 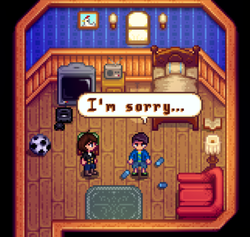 After about a week, all bachelors will forgive the player, and dialogues return to normal. After given a Mermaid's Pendant, before marriage, at the saloon or in Marnie's kitchen. When married, he'll admit to wishing "that he was six inches taller". When comparing the male sprites to each other during the Flower Dance cutscene, Shane is relatively shorter. He used to play for his high school's varsity gridball team. In Secret Note #7, it is confirmed that he one of three 'older bachelors' in Pelican Town. This page was last modified on 16 April 2019, at 20:25.